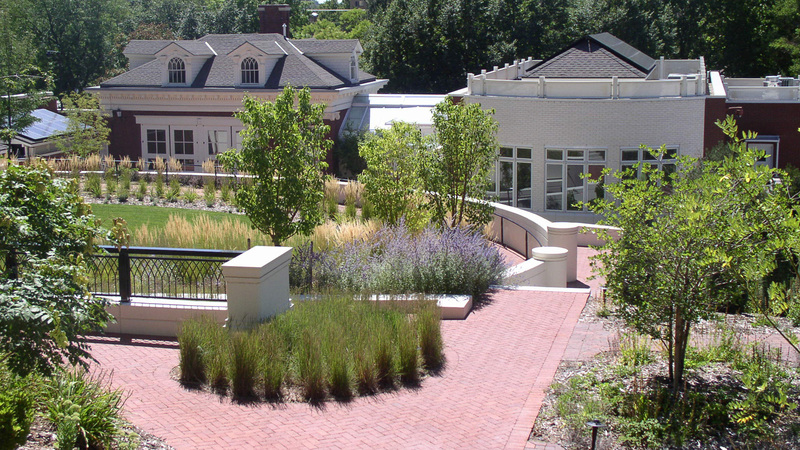 Born in Denver, Ries graduated from the Lowthorpe School of Landscape Architecture in 1932. She completed further studies at Colorado and Denver Universities, and the Rhode Island School of Design. In 1933 she began working for landscape architect Irvin J. McCrary. Just two years later, she opened her own office in Denver. Taking a break from practice during World War II, she served in the U.S. Coast Guard, working briefly for Skidmore, Owings & Merrill in New York City at war’s end. She returned to her own firm in 1947, which she operated until 1989, when she joined Land Mark Design as a senior advisor. Ries specialized in urban residential designs for both small and large homes. Her projects, which numbered over a thousand, showcased her signature style, formal but livable, welcoming from the street, and easy to maintain, integrating native and specimen plantings. 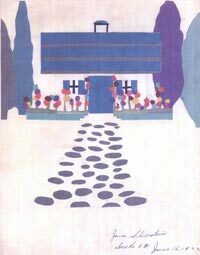 Her designs include: an Art Moderne house for a General Electric Demonstration project; and in Denver, the Herb and Scripture Gardens for the Denver Botanic Gardens; rehabilitated gardens of the Colorado Governor's Mansion; the restored gardens at the Molly Brown House; and the urban renewal redevelopment of Larimer Square. 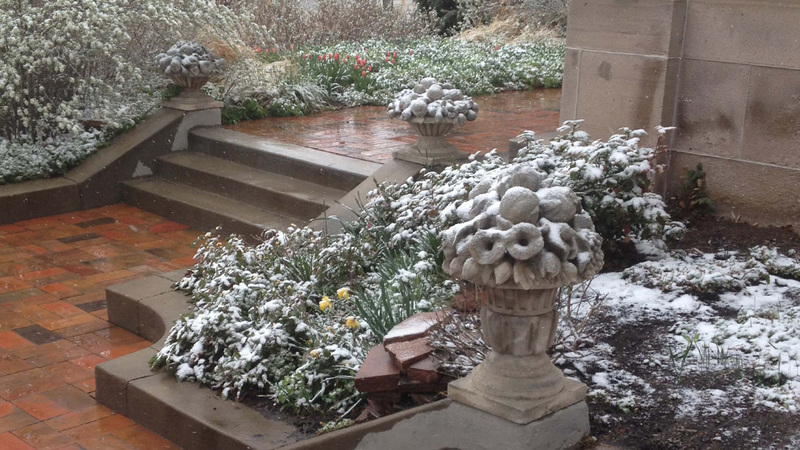 Her own garden was designated a Denver Landmark in 1992. In addition to her residential work her commissions included federal housing projects, civic, academic and religious buildings. Active in social causes, civic debate, and a mentor to many, Ries left her mark on the Denver community. She helped lead the way to promoting sustainable design in the region. She was inducted into the Colorado Women’s Hall of Fame; received the American Institute of Architects Denver Chapter’s Community Service Award, and the ASLA Medal in 2005. She was the third licensed landscape architect in the State of Colorado, elected a Fellow of the American Society of Landscape Architects in 1965 and was the first president of its Rocky Mountain Chapter which established the JSR Foundation in her honor. Julia Jane Silverstein was born in Denver, Colorado, where she attended the city’s public schools. She graduated from the Lowthorpe School of Landscape Architecture in 1932. She continued her education, attending Colorado and Denver Universities, as well as the Rhode Island School of Design, after it absorbed Lowthorpe in 1945. She began her professional career in 1933 working with Denver landscape architect Irvin J. McCrary on planting plans for Colorado University. Two years later she opened her own office in Denver. During World War II, Silverstein served the U.S. Coast Guard as a property survey and port liaison officer, rising to the rank of Lieutenant. 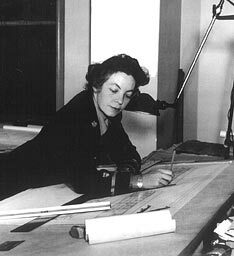 She worked briefly after the war as a landscape architect in the New York City office of Skidmore, Owings & Merrill. In 1947 she returned to her Denver practice. She married Henry F. Ries in 1953. Known professionally as Julia Jane Silverstein until 1961, she then assumed her married name and established a brief professional partnership with Julia Andrews-Jones. 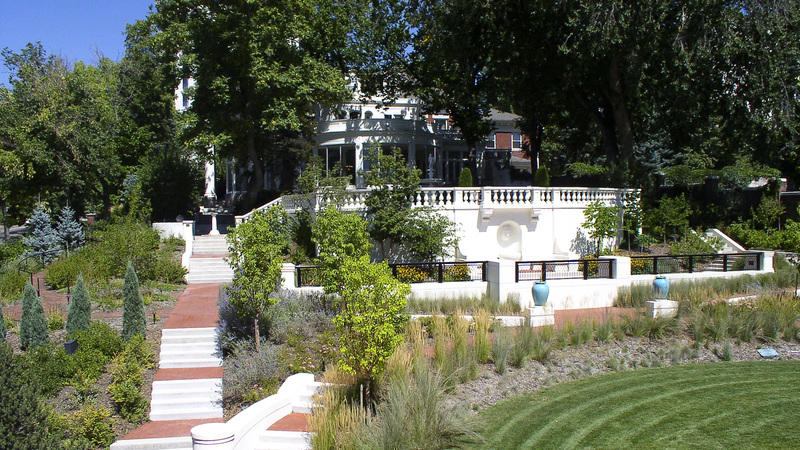 During her career, Ries concentrated on the design of gardens for both modest and fashionable homes, many of which were set on Denver’s ubiquitous small lots. Her signature style was immediately recognizable as it differed from the established uniformity of the city’s residential pattern of front lawn, foundation plantings, back lawn, and border garden. She designed a garden for an Art Moderne home, built in 1935 as a General Electric demonstration project, and gained wide and favorable notice. Her work reached a rich and versatile dignity in her middle years. And her services continued to be in great demand throughout the remainder of her career. Ries walked into a space and saw potential. Her back gardens were private and livable, small spaces sequestered by hedges from the crowded urban scene. Elegant and usually formal, often intimate yet sculpted and articulated to seem grand, they were easy to maintain and not inordinately thirsty. For inspiration, she looked to the walled gardens of Beacon Hill in Boston which enchanted her when she was at Lowthorpe. She later made her own contribution to the Beacon Hill ensemble with a garden design for a Pinckney Street residence. Yet she was able to use the same themes and serve the same purposes in making Modernist gardens. As for the view from street and sidewalk, her sensibilities were captured in a charming collage made when she was thirteen. A textured walk says welcome, sculpted trees dramatize a traditional house, and flowers in abundance evoke the spirit of joyful residents. Ries looked to these simple themes to guide her work, including her street-front plan for the 1935 Art Moderne house. Her 1958 design for a Modernist garden in Denver’s Hilltop neighborhood featured a shaded entry court punctuated by native plantings. And her own gateway garden was an experimental bramble, and was officially designated a Denver Landmark in 1992. Though urban gardens were at the center of her practice, her commissions included federal housing projects, large estates, churches, courthouse grounds, and mortuary parking lots. And though her Arcadian sensibilities were obvious, she adopted her own regional palette, she incorporated local plant materials into her earliest gardens, and she established a clear ethic for the development of suburban, prairie, and mountain sites. She could slip a home into the natural cover and topography without disturbing the existing land. Vistas and native vegetation thus became the garden, yet she would frame the home with comfortable viewing platforms and discreet specimen plantings. 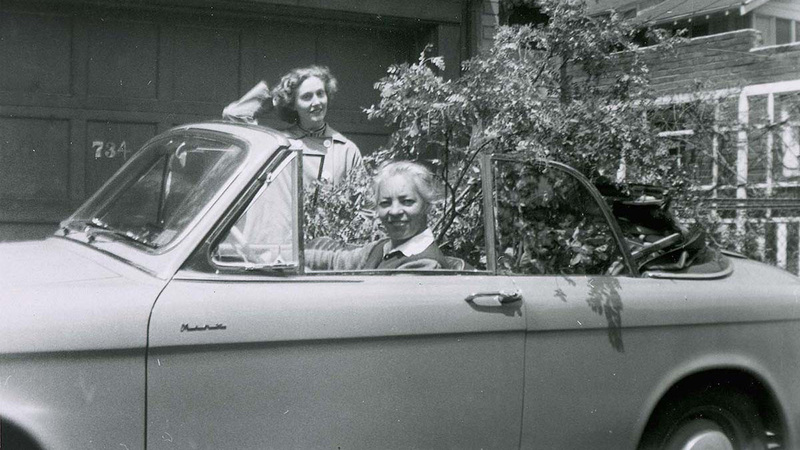 Ries was the first woman in Denver to pursue a career in landscape architecture. Her office also served as headquarters for an array of other professional, civic, and social endeavors. She presided there as a role model and mentor for professional women, particularly in her profession; as a teacher to her dedicated assistants; and as a cheerleader, tireless volunteer, and sage. In her later years she became the doyenne of her regional colleagues. Her passion also extended to social causes not directly related to her profession, but which she saw at the ethical heart of awareness, understanding, and stewardship of the land. Ries believed that every professional, indeed every citizen had a responsibility to participate in civic debate. For over half a century, few land use issues were addressed in Denver or Colorado without the benefit of her wisdom. She shared her knowledge of various topics, including the importance of prairie and mountain lands; the need for mass transit; the blight of poorly designed houses and rampant growth; the propagation of a shrub rose brought west by pioneers and a hardy boxwood now called “Julia Jane”; Dutch elm disease; the paucity of good planning; drought; and the replacement of street trees. Ries was elected a Fellow of the American Society of Landscape Architects (ASLA) in 1965. She was the first president of the Rocky Mountain Chapter of the ASLA, now the Colorado Chapter. She was awarded The 2005 ASLA Medal. She was a consultant to mayors and governors and had the ear of the city’s opinion makers. She nurtured collegial relationships among design professionals and, over her long career, her perspective, personality, and impact on the land were an inspiration to virtually every other Colorado landscape architect. She served on multiple boards, committees, and commissions, and she contributed her professional services when solutions were not otherwise available. After World War II, Ries was part of an informal yet influential group including horticulturist George W. Kelly and, in addition to Ries, landscape architects S. R. DeBoer, Sam Leslie Huddleston, Irvin J. McCrary, and M. Walter Pesman. They led the way in promoting sustainable and satisfying landscapes for Colorado’s semiarid, high altitude environment. Ries also became a key player in the maintenance of Denver as an exemplar of a green, tree-shaded, and flowered City Beautiful. Ries was always as focused as she was indefatigable. Through ASLA and Colorado Chapter ASLA committees, she defined the importance of preserving historic landscapes. 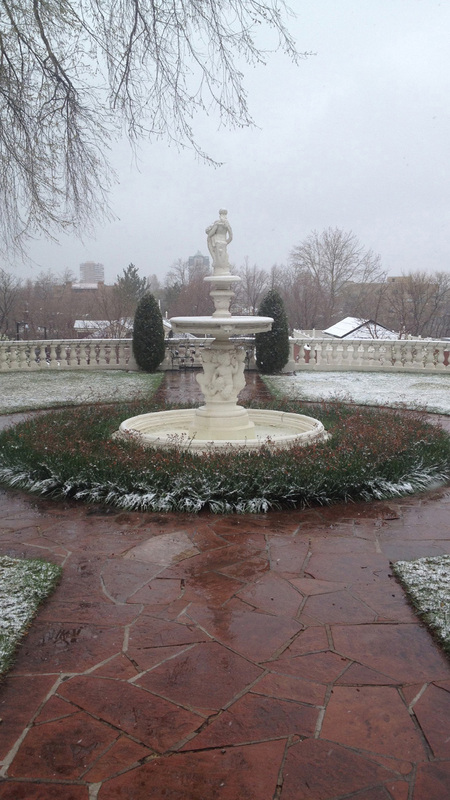 She helped spearhead early efforts to rehabilitate the grounds of Colorado’s Executive Mansion. She volunteered as a consultant in the restoration of the Molly Brown House Museum garden and creation of the Ninth Street Historic Park. She developed early plans for the Larimer Square redevelopment. And she served on the Colorado Chapter ASLA publication committee for Colorado: Visions of an American Landscape, a 1991 book written by Kenneth Helphand and sponsored by the Landscape Architecture Foundation. Ries became the institutional memory for the history of Denver’s landscape and those who shaped it, particularly after S. R. DeBoer’s death in 1974. She was responsible for a plethora of projects, including over a thousand gardens, thus leaving her own direct mark on the landscape. Ultimately, an institution herself, she received numerous awards for her life’s work, including induction into the Colorado Women’s Hall of Fame and the AIA Denver Chapter’s Community Service Award. In recognition of her pioneering sense of awareness and stewardship of land use values in the Rocky Mountain Region, the Colorado Chapter of the ASLA established the JSR Foundation in her honor. That foundation grants scholarships to students of landscape architecture. It has established a prestigious annual lecture program. And its first annual award was conferred on Ries. Determined not to think about retirement, Ries joined Land Mark Design as a senior advisor in 1989, and encouraged that firm to carry on her legacy. Ries passed away in 2005. Ries’s many residential commissions (including client names, plans, and drawings) are documented in Jane Silverstein Ries Papers, 1934-1992 in the Western History Collection at The Denver Public Library. Three commissions stand out: the expansive Anderman garden where flower beds melt into the prairie before a mountain view; Ries’s own residential and studio gardens, front and back, which evoke an elegant past and reveal a sustainable ethic; and the Touff garden, a suave Modernist statement that is both pleasing and utilitarian. 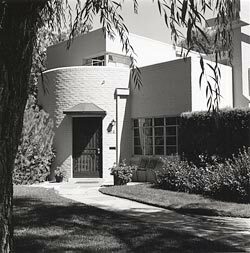 Etter, Don D. Denver Going Modern: A photographic essay on the imprint of the International Style on Denver residential architecture. Denver: Graphic Impressions, Inc., 1977. Ries, Jane Silverstein (as Julia Jane Silverstein). “Water in the Garden.” The Green Thumb 16, no. 6 (1959): 198-201. Jane Silverstein Ries Papers, 1934-1992 (“JSR Papers”). WH 1785, Western History Collection, The Denver Public Library. Shaw, Betty. “The Artistry of Landscape Design.” Colorado Homes & Lifestyles II, no. 1 (1982):118-23. Varnell, Jeanne. Women of Consequence: The Colorado Women’s Hall of Fame. Johnson Books, 1999.